New Belgium stamps, with the left facing profile of King Leopold II, began appearing during 1870. Along with the lower denomination numeral stamps, they were the first postage stamps of Belgium to have the country name printed on them. Even though more than half the population speaks Dutch, the country name is in French, the official language of the government. The twelve Belgium stamps shown above were issued between 1869 and 1875. 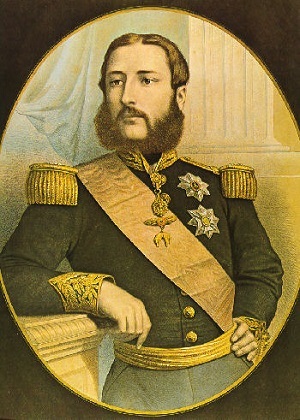 The lower denominations feature a large numeral, and the higher denominations feature the left-facing profile of King Leopold II. These stamps are typographed and perforated 15. 1 C. (1869 - Scott #28) - Green. 2 C. (1870 - Scott #29) - Ultramarine. 5 C. (1870 - Scott #30) - Buff. 8 C. (1870 - Scott #31) - Lilac. 10 C. (1869 - Scott #32) - Green. 20 C. (1870 - Scott #33) - Light Ultramarine. 25 C. (1875 - Scott #37) - Olive Bister, Ocher. 30 C. (1870 - Scott #34) - Buff, Reddish Ocher. 40 C. (1870 - Scott #35) - Bright Rose, Rose Lilac. 50 C. (1875 - Scott #38) - Gray, Gray Black, Deep Black. 1 F. (1870 - Scott #36) - Dull Lilac, Rose Lilac. 5 F. (1875 - Scott #39) - Deep Red Brown, Pale Brown. The 1 C., 2 C., 5 C., 10 C., and 25 C. denominations were reissued in 1881. The reissued stamps are perforated 14. 1 C. (1881 - Scott #40) - Gray Green. 2 C. (1881 - Scott #41) - Light Ultramarine. 5 C. (1881 - Scott #42) - Orange Buff, Red Orange. 10 C. (1881 - Scott #43) - Gray Green. 25 C. (1881 - Scott #44) - Olive Bister. Many of the denominations in this definitive stamp series were printed with both regular and aniline inks. The Scott catalog does not list them separately. The four stamps shown above were issued in 1883. They are also perforated 14. 10 C. (1883 - Scott #45) - Carmine. 20 C. (1883 - Scott #46) - Gray. 25 C. (1883 - Scott #47) - Blue. 50 C. (1883 - Scott #48) - Violet. The six new stamps shown above were issued in 1884 and 1885. They are also perforated 14. 1 C. (1884 - Scott #49) - Olive Green. 1 C. (1884 - Scott #50) - Gray. 5 C. (1884 - Scott #51) - Green. 10 C. (1884 - Scott #52) - Rose on Bluish, Rose on Grayish, Rose on Yellowish. 25 C. (1885 - Scott #53) - Blue on Pink, Blue on Dark Rose. 1 F. (1884 - Scott #54) - Brown on Greenish, Deep Brown on Dark Green. The five new stamps shown above were issued between 1886 and 1891. These stamps are perforated 14. 2 C. (1888 - Scott #55) - Purple Brown. 20 C. (1886 - Scott #56) - Olive on Greenish. 35 C. (1891 - Scott #57) - Violet Brown on Brownish. 50 C. (1886 - Scott #58) - Bister on Yellowish. 2 F. (1886 - Scott #59) - Violet on Lilac.